Shepherd University psychology students are teaching weekly mindfulness lessons to kindergarten students at Shepherdstown Elementary School. 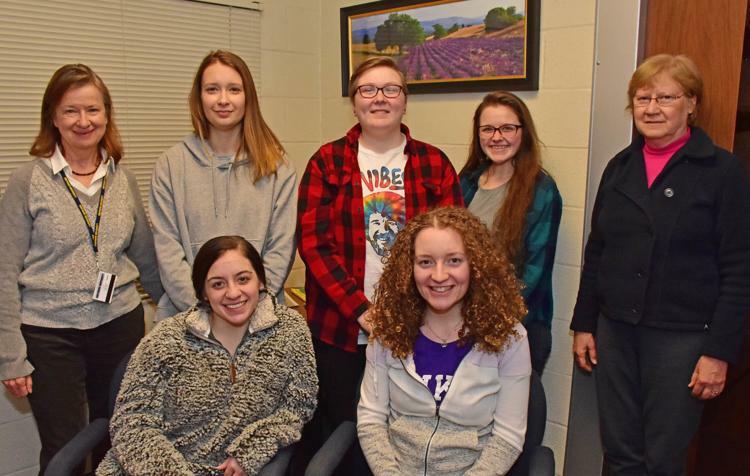 Pictured seated, from left, are Taylor Carroll, Kearneysville; and Lacey Emry, Winchester, Virginia, standing, Dr. Anne Murtagh, associate professor of psychology; Alaina Hilditch, Falling Waters; Katlyn Brantner, Augusta; Samantha Keplinger, Augusta; and Suzanne Offutt, retired principal of Shepherdstown Elementary School. SHEPHERDSTOWN — Children in the three kindergarten classes at Shepherdstown Elementary School are learning special lessons from Shepherd University students through a collaboration to teach mindfulness meditation techniques to the younger students. Dr. Anne Murtagh, associate professor of psychology at Shepherd, and Dr. Suzanne Offutt, retired principal of Shepherdstown Elementary, are leading the project, which includes collecting data on how the lessons are impacting the kindergarten students. Murtagh said meditation is a set of techniques to train and focus the mind, and mindfulness involves tuning into the present moment with full awareness and without judgment. Part of the training includes teaching the children basics about the brain and how in times of stress the “wise leader,” or prefrontal cortex, is less in charge. By pausing and breathing, this wiser part of the brain can guide one’s actions. Students also learn about mindful seeing, mindful movement, kindness, and gratitude. Murtagh and Offutt have trained five Shepherd students in mindfulness, basic child development for kindergarteners, the ethics of working in a school and with young children, and the practical aspects of visiting the school and kindergarten classrooms. The Shepherd students are leading 10 weekly lessons in each classroom using the MindUP curriculum, which is designed to help improve behavior and learning. The Shepherd students who are participating are enrolled in a Faculty-Led Research class and are collecting information about the effectiveness of the mindfulness lessons. “We are collecting data from the kindergarten classes on behavior issues that happened at the end of last semester and then again at the end of this semester to see if there’s any improvement in the self-management of their behavior by the measures that we have,” Murtagh said. 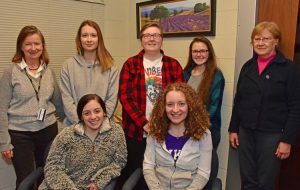 The Shepherd students who are participating are psychology majors Taylor Carroll, Kearneysville; Alaina Hilditch, Falling Waters; Katlyn Brantner and Samantha Keplinger, both from Augusta; and Lacey Emry, Winchester, Virginia. They have been meeting every week to prepare the lessons. Hilditch, who is also interested in a career in child psychology, said she understands children often need extra help because she has a friend who confessed he tried to commit suicide at age 7. Brantner, who wants to go into counseling, said she had not meditated before and this is her first experience working with Murtagh on a research project. Keplinger plans to go into child psychology and hopes to help and comfort children suffering from severe trauma. Emry has been practicing meditation and attending Meditation Mondays, which Murtagh leads every Monday from 12:05-12:50 p.m. in the Student Center Cumberland Room and is open to the students, faculty, staff, and community members. Emry said working with 5- and 6-year-old children is interesting. Kindergarten teacher Melissa Back said her students have enjoyed working with Keplinger and Brantner, who visit her classroom once a week. Back said her students are also learning the names of different parts of the brain and how they work. She said the students’ ability to breathe mindfully for a minute continues to improve and they are applying the knowledge they learn during the mindfulness lessons when they are stressed or upset.